Every new year is filled with renewed aspirations, dreams and resolutions and you make sure to get over them by the end of the year. 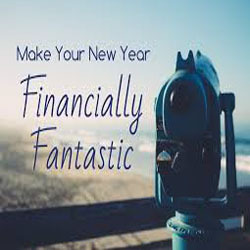 So kick back on your couch and find out how you can make most of the new year financially. Just as the body requires consistent exercise to remain fit and healthy, so as your finances. You can exercise your financial muscle by getting into the habit of savings. ShubhBank shows you the way of paying more attention and care to grow your finances faster and turning yourself into a financial fit. Don’t let your financial resolutions to sit in a dark corner, just set some financial fitness goals for yourself. We have compiled some ways to develop financial habits that are super easy to follow. Your credit history is a map of your financial behaviour.It is an extremely crucial document and provides a comprehensive overview of your monetary habits.Take a step towards financial discipline that will aid you in making better and informed financial decisions in the future. In the old days, the dearth of information made life not only difficult but uninteresting too. Nowadays technology empowers you to manage your personal finances. You can track your income, expenses and investments, all through your smartphone. Equip yourselves to know more and before investing your hard-earned savings, it’s good to study the markets and gauge the amount of risk involved. You may begin to enjoy the technology once you start using tools to manage your finances. If you are a travel junkie, you probably don’t realise that your tours eat into your income every month. So we have a few tips to help you travel on a budget. 1. Make use of offers and benefits on Travel credit cards. 2. Book a homestay or a rental house instead of spending huge amount on a hotel. 3. Create a travel fund separately and keep saving a decent amount every month. It is advisable to start planning for retirement as early as possible. Saving a chunk of your income for life after retirement is not enough as savings won’t grow over time. Starting early will not only give you ample time to have savings that will letyou have a longer span of time to grow. When it comes to Credit Cards, there are number of options. To choose one, make sure you know what you are going to use the card for. You can choose Credit Cards for number of purposes including travel, shopping, entertainment, etc. You can pick Credit Cards that are heavy on rewards and cashback. Lastly and most importantly use your cards wisely. Setting up a contingency fund should be at the top of your priority list.Unexpected expenses tend disarray your finances so these funds provide you safety net to meet with financial crunch. If you are looking for financial products, ShubhBank have plenty in store for you. Just take a tour of our website and choose your pick.